Though especially tasty for those of us who live in Southern California (because some of the landmarks are familiar, still to this day) it really is a wonderful photographic exercise that I hope many people see; we can all relate in some way to these photos; electricity touches us all (for better or worse). Taken by photographers employed by the Southern California Edison Company over the past 100 years, it shows beautiful images of people, landscapes and industry impacted by and embracing the spread of electricity. "The Southern California Edison archive holds a jaw-dropping array of 70,000 images; these date from the late nineteenth century through the early 1970s and are accessible at The Huntington. 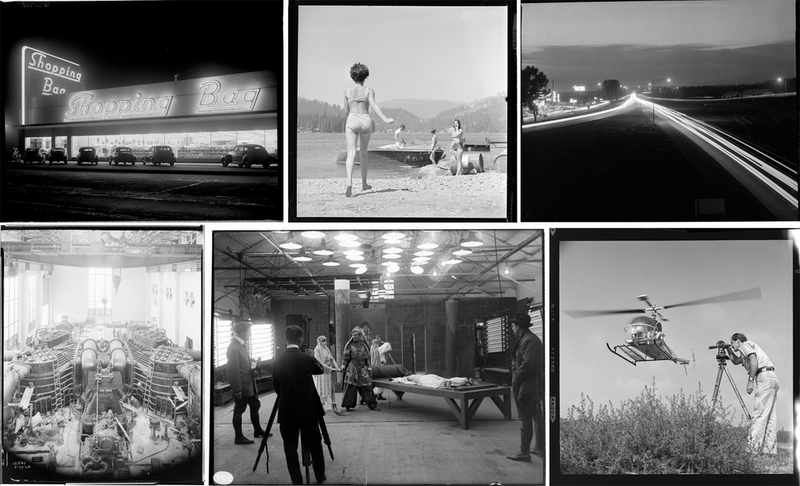 At once a record of electrification of the Los Angeles Basin, the collection is also – as the photo essays which constitute this exhibition so aptly demonstrate – a visual narrative of change in and on the built landscapes of greater Los Angeles during a key three or four generations of explosive metropolitan expansion." I've never thought about an underwater pool light as something that might rock my world, but when I see these images, you can imagine that it did just that at that time of its invention. And electric street lights? What better city to line all these emerging streets and highways with electric lights? I wonder if So Cal Edison is still employing photographers today. What interesting images might they take today?... electric cars hooked up on the driveway of a suburban house? The wind-powered windmills in the desert? Solar panels on suburban rooftops?